Different runway, but you get the idea. Tokyo's Haneda Airport was temporarily dogged by flight disruptions after a poodle made a dash for freedom causing multiple flight delays. The large poodle, had been checked onto a Japan Airlines flight bound for Naha, Okinawa Prefecture. But moments before being loaded into the aircraft by baggage handlers, it escaped -- directly into flight traffic. 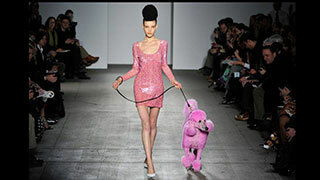 The dog's playful antics shut down one runway for several minutes and resulted in 14 flight delays. It took 40 minute to eventually capture the animal. How did they do it? You guessed it: its owner was called in to coax it back onto the aircraft. Japan Airlines said it is investigating how it happened and whether aircraft loaders followed all the correct procedures.